Keep a feminist mantra close to heart with this inspirational tribute to girl power. 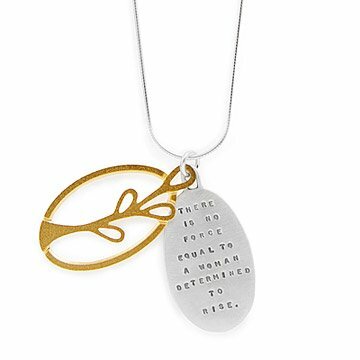 Celebrate female empowerment with Kathy Bransfield's Powerful Woman necklace, which features a sterling silver pendant bearing the statement, "There is no force equal to a woman determined to rise." A 22-karat gold-plated pendant is layered over it, showcasing a delicate tree rising fearlessly from the earth. Sterling silver chain. Handmade in California. Very disappointed. The lettering was totally unreadable. Just looked like blurry dots. I already have. My daughter & I swaped them as Xmas gifts. as a reminder to be thoughtful, considerate, and grateful to one another each and every day. I would not, unless the stamp was clearer. Love the phrase stamped on the tin piece, but it was not stamped clearly and was hard to read. It did not look like its photo. Almost seemed blurry. Great product, really like it, great gift for my girlfriend graduation, unique also. The two-tone is nice. Great for everyday wear. The inscription was perfect for the occasion. My God Daughter is about to embark on a difficult and sometimes harrowing journey into the legal profession at a very large law firm where she's going to be faced with competition and pressure to succeed. She already has the intelligence and confidence she needs. The inscription on the necklace will serve as a loving reminder that there is someone out there pulling for her, ALWAYS. Great for a graduation gift.